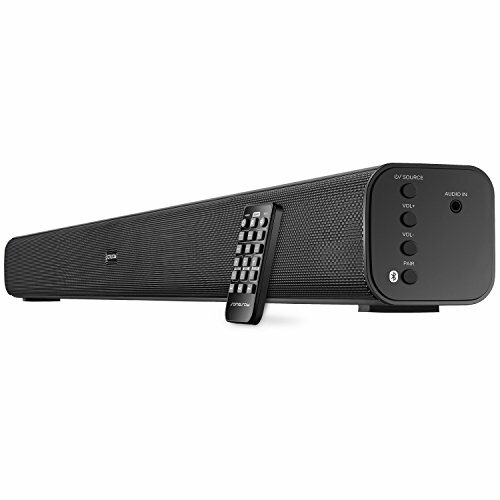 32-Inch 30 Watts Soundbar: This Sound Bar with built-in 4 high full range high quality speakers with 2.0-channel audio pack plenty of power to give your movies, sports, games and music fuller, higher, room-filling sound beyond traditional stereo. More humanized design, will not hurt ears by high decibels. This sound bar delivers the clear loud sound up to 103 dB that your TV can't. Wired or Wireless Connection: Modern and traditional devices can work with the speaker thanks to Bluetooth or wired connections that include Optical input / Line in input / RCA AUX. Easy Connect with Your Flat TV/Tablet/Computer/Phone for a immersive surround sound experience. Button or Remote Control: Dual operation modes for convenience that feature key controls on soundbar or a remote control to adjust basic playback settings including play/pause, volume switch mode, and track selection, enjoy your music, news,movies freely. What You Get: Bluetooth Sound bar, Remote Controller, Power Adapter, Optical Cable, RCA Aux Cable, 3.5mm Line audio Cable, User Manual and 18 months extended warranty. If you encounter any problems, Pls feel free to contact us. If you have any questions about this product by Samesay, contact us by completing and submitting the form below. If you are looking for a specif part number, please include it with your message.